Last week, Portia and Morticon, local red panda and wallaby, respectively, held a public open house to show off their new home. After the destruction of the Society of Evil Doers headquarters, Morticon was looking for a new home. Portia also was seeking new digs. As they had a professional relationship at the SED and were close friends they decided to purchase a home together. Before renovations on the home could begin however, the previous owner had to be evicted, in a sense. 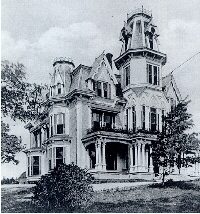 Portia and Morticom were able to get the house at well under market value due to the fact it was haunted. Portia held a meeting / ceremony to release the spirit from the home. It was successful and soon adaptations were being made to make the house comfortable for red pandas, wallabies and their guests. Portia and Morticon have hired Ceredwyn, local wolf, to act as Butler, and he did a fine job of laying out hor'dourves and drinks for the party guests. He also led a guided tour through the home. 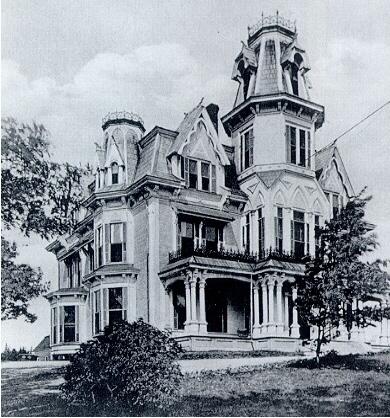 Portia's artistic taste and her unique sense of style were displayed as the house was decorated beautifully. Certain areas were not included in the tour, but in any home bedrooms and other portions of the dwelling may not be opened even to very close friends. Although, unlike many SED / Morticon events, I witnessed no ninja attacks, traps, "funny" food, or other SED hi-jinx. Even Kunoichi-san, from the Kunoichi Corporation who has experienced some friction between her organization and the SED was welcomed and treated politely. Perhaps Portia wanted to have an enjoyable evening and encouraged Morticon to allow it. In spite of having to leave early due to other obligations, the event seemed to be a success and everyone seemed to enjoy it. Why are things so quiet? Why does there seem to be so little going on? Perhaps it's because so many folks are off to Morphicon! Morphicon is a gathering of all sorts of folks, puppeteers (Well, "actors" as they like to be called who perform with their puppet partners,) art fans, fursuit actors, artists, anime and science fiction fans, and lots of others. Just go to the site and look over the schedule of events, all sorts of things are going on in Columbus Ohio this week. The logo of the con, shown to the left, is a play on the anime movie / series Ghost in the Shell. At first glance I thought is was some of Doug Winger's work, due to the tubes and wires. As closer examination of the image revealed none of the wires and tubes were connected to any personal areas and the goat hadn't been "Wingerised", I realised it was a reference to the TV show / Movie. Although it seems to me to have a resemblance to The Matrix as well. The logo aside, it is hoped that next week's edition of @Action News will have a full report on the doings at Morphicon. 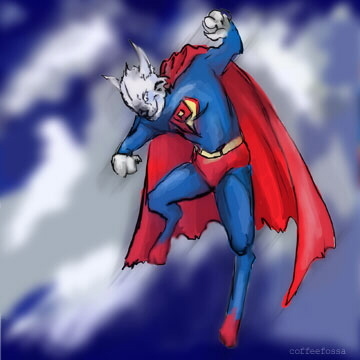 Patch O'Black Four-Kolor Kitty: Super-Hero, The Other White Meat! Greetings and welcome to another spleen-tingling installment of Four-Kolor Kitty. Following up on last week's look at Spider-Man, it was suggested by the bug bruin, Ba'ar, that we look at an alternate version of the web-slinger: One Peter Porker, the Amazing Spider-Ham! Yep, there is a sunny-animal version of the wall-crawler! 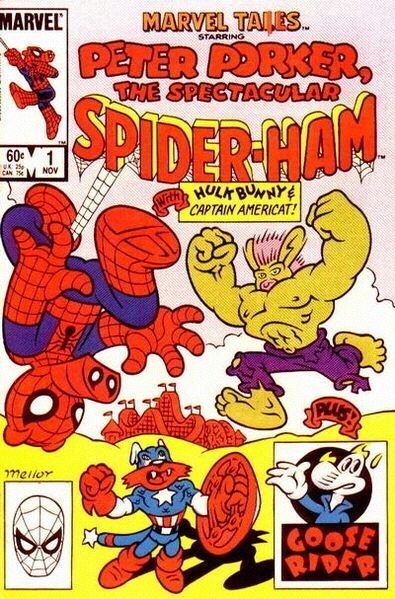 Now, while Spider-Ham seems to be a porcine copy of the original, his origin is a bit different. You see, Spider-Ham didn't start of as a pig. Nope, he was a spider simply named "Peter", residing in May Porker's basement. May, unlike her counterpart, was actually a scientist, and was working on an atomic-powered hairdryer. Yes, you heard me, atomic powered-hairdryer. Anyhow, as must happen in all good origin stories, something goes awry, and May become temporarily radioactive and...bites Peter! So, Peter gains the form of a pig, while retaining his spider abilities. Thus, he becomes more than ether part and is reborn as Spider-Ham! May, unfortunately, seems to lose her scientific knowledge and comes to believe herself the aunt of Peter, who takes on the family name and decides to help out the poor lady. As is the case with these things, there are animal versions of just about everyone in Spider-Man's life. His girlfriend Mary-Jane Waterbuffalo and his boss, J. Jonah Jackal. In one of his earliest adventures, he teamed with Captain Americat (who's secret identity is Steve Mouser) and battled the Hulk-Bunny. Even had a Goose-Rider backup story. More recently, Marvel showed that in the possible timeline that Spider-Girl, the future daughter of Spider-Man, exist, Spider-Ham was a short-lived cartoon series. It was, in fact, created by one of Spider-Man's enemies to embarrass him and to lure him into a trap. It was used again to lure Spider-Girl into a similar trap. 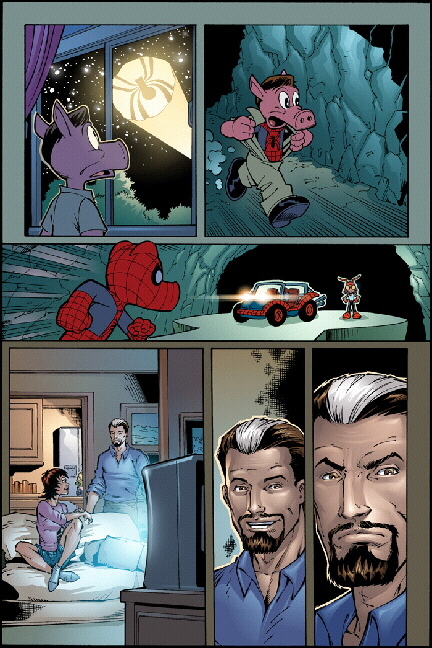 This version of Spider-Ham showed Peter Porker, not as a counterpart to Peter Parker, but as a millionaire similar to Bruce Banner, with a Spider-Cave and all that. So, there you have it. Spider-Ham, the porcine web-slinger. You may now collapse in a fit of school-girl-like giggling. Who knows where this hero will show up next! I certainly don't, but join us next week for another Four-Kolor Kitty! And remember, keep sending those questions and suggestions for topics! Ba'ar is off doing bear things so I'm doing this week's survey. The question this week is: "All of us have a few stuffed animals around. Of all the 'plushes' you have, which one is your favorite?" Darius says, " I have a folkmanis badger puppet plush that is my favorite." Nyni cutely says, "I got too many to choose!" Shoe oinks, "Gard a big blue bunny who has a bow with carrots on it around his neck and he is wearing blush." 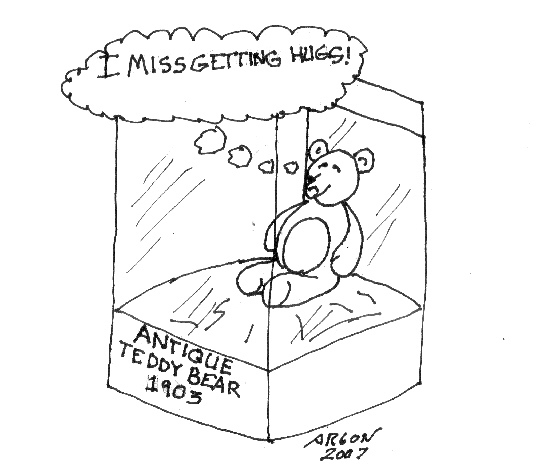 Argon says, "I have a small teddy bear that lies on top of the passenger side sun visor of my truck named Theo." Carl click clacks, "None. They don't last long under water."